The Army Corps of Engineers last fall halted cleanup of fuel-tainted soil near Birch Lake, about 60 miles south of Fairbanks, when workers uncovered buried junk that included barrels with residues of a different contaminant – the banned pesticides DDT and chlordane. Cleanup project manager Beth Astley says contractor workers discovered the junk while excavating soil contaminated by leaky fuel-storage tanks in an area that’s now part of the Birch Lake State Recreation Site. Astley says Anchorage-based Bristol Environmental Remediation Services had to stop excavating the site because its contract called for removal of soil contaminated by fuel. 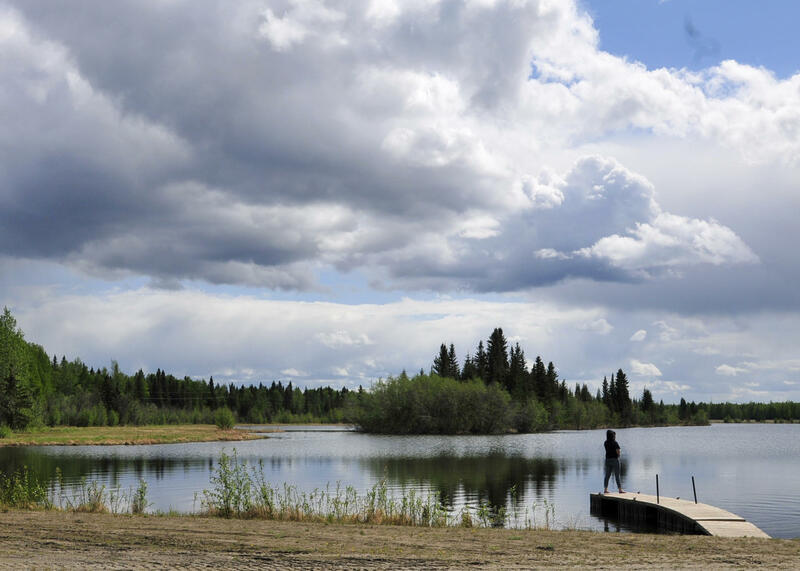 The Birch Lake cleanup is one of several the Corps has conducted in recent years along the old Haines to Fairbanks Pipeline, a 626-mile, 8-inch line built by the military in the 1950s and shut down in 1973. Astley and other Corps officials talked about the discovery of the toxins last week at a public meeting in Delta Junction. Astley says workers found the debris about three feet below the surface in an area between where two large above-ground tanks were located. She couldn’t say exactly how much of the debris is buried at the site. She says a geophysical survey the Corps conducted at the site last month may help agency officials estimate the amount of excavation that’ll be needed to remove the junk, which includes some crushed 55-gallon drums that may have been used to mix the pesticides. Astley says the DDT and perhaps the chlordane were being used to kill mosquitoes. That was a common use for DDT from when it was developed in 1940s until it was outlawed in 1972. It’s categorized it as a carcinogen, and tests have shown other health impacts. Chlordane was used as a pesticide from 1948 until it was banned in 1988 after tests linked it to neurological and reproductive systems disorders. But Astley says the toxins shouldn’t present a health threat now that the junk has covered with a plastic liner and re-buried with clean fill. “And so now the next step is to go back and to investigate the extent of this buried debris and to remove any hazardous debris or soil remaining at that site,” Astley said. Astley says once that analysis is done, Corps officials will develop a new contract would to remove the junk and contaminated soil. She says if all goes well the work could be done in the summer of 2020. Astley’s state counterpart agrees the junk shouldn’t threaten human health, both because it’s been re-buried and because it appears there were only small, residual amounts of the pesticides in the crushed drums and cans. Duncan, who’s been working with Astley on the cleanup projects, says the Corps’ tests showed the presence of the pesticides in soil around the buried junk, but she thinks it’s unlikely to have seeped into the groundwater or the lake’s surface water. She says DEC will, however, likely conduct tests to confirm that. “That is on our radar, as is groundwater (testing),” Duncan said. Astely says the Corps has finished its cleanup of the Birch Lake site and another near Quartz Lake. She says the Corps officials now plan to study another lesser-known site near Tenderfoot Creek, just north of Shaw Creek, where the pipeline burst in 1971 and spewed fuel into the creek.